Too bad dead pigeons are only the beginning . . . Margaret Welch is in her idea of heaven. She has what many people only dream of - a successful bookstore in a charming old house. Even better, she and her bookstore are located in Stonewall, a town nestled in the foothills of Tennessee's Blue Ridge Mountains. Unfortunately, Margaret also has a sister - Bitsy. The morning Bitsy flings a dead pigeon on her sales counter Margaret redefines her mission in life. "Never assume anything as far as Bitsy is concerned" sound like sane words to her, and that's good, because Margaret's going to need them. Next on the scene is a mysterious stranger, quickly followed by the Dumpster incident, the renegade goats, and the exploding goldfish pond. When events take a murderous turn, Margaret realizes, for her own safety and sanity, she'll have to pull her nose out of her bookstore and solve the crimes herself. Margaret and Bitsy have entertained readers through seven short stories in Alfred Hitchcock Mystery Magazine. 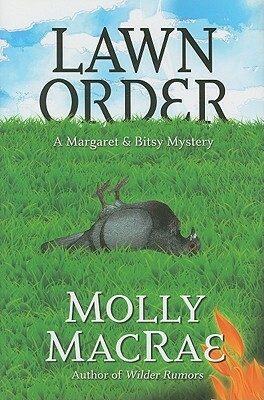 Lawn Order is a small town mystery that will keep you laughing and guessing from start to finish.